Please refer to our stock # 11145 when inquiring. 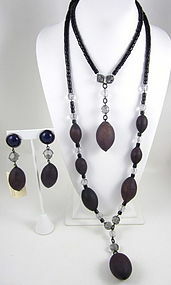 This sophisticated vintage necklace and earrings set was made for the couture line of Giorgio Armani. The necklace has a wearable length of 16" and drapes down 13" in front while the coordinating earrings are 3 1/2" long x 1" wide. It black jet beads with large acrylic beads with a deep brown/violet tone. It has clear/crystal bead accents and copper tone metal findings. The set has the original paper drop tags and the earrings are signed "Giorgio Armani" while the necklace has the "GA" logo drop tag. The set is in excellent unworn condition. This is not from the emporio collection, but the high end "Armani Collezioni".